The Nolet family has been distilling gin since 1691 at their Schiedam, Holland distillery and make the claim of being the oldest surviving distillery in the country that is the home of gin, namely genever. They are not only known for their gin, however, as in 1983 the now 10th-generation of the family released the very popular Ketel One Vodka. A distillery with such history is an unlikely source for one of the new styles of gin that has a rather noticeable lack of juniper, the key botanical defining gin. Instead, Nolet's Silver Dry Gin is fruity and floral (Turkish rose, peach, and raspberry) which, depending on your view of gin, is either an improvement or a heresy. Let's be honest; traditional gin lovers who thirst for the lovely pine of an old-school gin will likely find the likes of Nolet's a travesty. The great news for these drinkers is that there is no lack of juniper-laden spirits available. Nolet's is geared toward those drinkers who are generally put off by bold juniper in their drinks. This could be those who gravitate toward vodka, fruits, and soft floral drinks. For these drinkers, Nolet's will be an excellent choice. There are also those Martini drinkers who like to change up their routine or have a gin cocktail with a lighter profile every now and then. This is a gin that bridges the gap between extremes in taste and many find it a fascinating addition to the bar. Will it replace the great London dry gins? Probably not, but it can serve as a supplement that opens the gin cocktail to new possibilities, much in the same way that the cucumber-forward Hendrick's has. 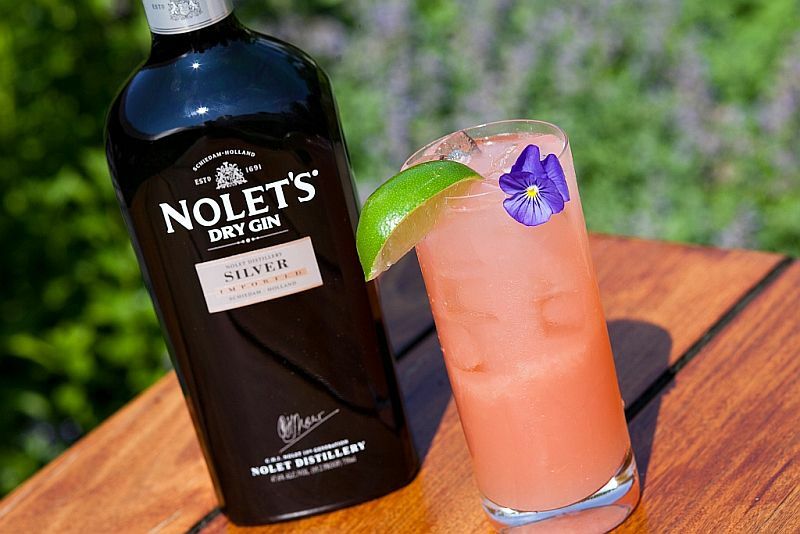 If you enjoy the fruit and rose aspect of that modern gin, consider giving Nolet's a try. This gin has a soft and delicate yet rich flavor profile that begins with the rose-laden fragrance accented with fresh peach and the slightest hint of pine. On the palate, this gin follows suit with raspberry shining through ever so gently and an interesting, gentle mix of juniper, orris root, and licorice hanging out in the background. The dry finish is where the juniper becomes less transparent, leaving the experience with welcomed familiarity. These uniquely profiled gins can make it a challenge to find the right cocktail to mix. Begin by eliminating a few: the likes of a Dirty Martini, Smoky Martini, and Barbary Coast. Gin cocktails with darker, dirtier, and creamier ingredients simply will not work well with a gin this floral and fruity. That said, there are plenty of popular and new gin cocktails that will do Nolet's justice. This gin will make a great Martini with a fun, light profile (use orange bitters), though this a better gin for a Martinez as the fruit aspects are ideal pairings for the classic cocktail's sweet vermouth and maraschino. The French Martini, Gin Rickey, and Park Avenue are also great options for adding a twist to popular cocktails. The pattern here is to stick with gin cocktails that have a light, fruity, floral profile that compliments Nolet's unique aspects. You can also take a lesson from recipes using other modernly styled gins. The ginger, mint, and lemongrass in New Amsterdam Gin's Soho is a delight with Nolet's, and the combination of rose jam and Champagne in Hendrick's Royal Rose Cocktail seem to have been made for either of these gins. Modern cocktails like these are where Nolet's is going to truly shine, and two of the brand's signature cocktails are in keeping with this train of thought. Floral and fruit-forward dry gin.